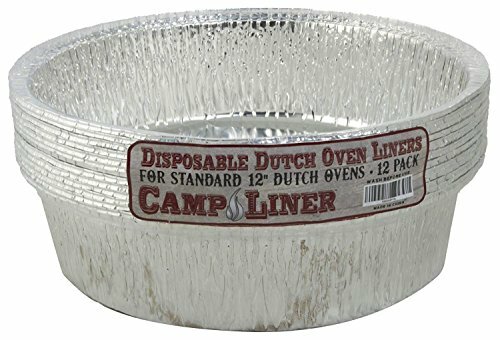 CampLiner preformed Dutch oven liners are a perfect fit when it comes to cooking in the outdoors. Your cleanup will be a snap and you can enjoy the outdoors even more. The liners are strong enough to stir in and even lift your meal out of the oven for serving without the heavy, dirty, hot Dutch oven. You can now prepare dinner and dessert in the same oven. Just lift out your dinner and pop another liner, with your dessert already in, into the hot clean Dutch oven. These are perfect for large groups and Scouting. They come in three sizes and fit most ovens. We do not make a "Deep" version but the regular liners can be used in deep ovens if you fold up the sides, or hang the liner off the bottom for breads etc. They store perfectly in your oven for travel. Try them on your next outing. If you have any questions about this product by CAMP LINER, contact us by completing and submitting the form below. If you are looking for a specif part number, please include it with your message.